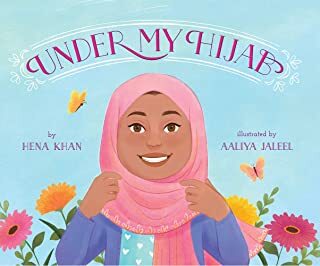 Under My Hijab, written by Hena Khan and illustrated by Aaliya Jaleel, is a celebratory picture book that highlights the diversity of Muslim women and girls. The story unfolds from the point-of-view of a pre-adolescent girl who does not often wear a hijab, likely due to her age. The reader is introduced to women in her world who do wear a hijab, all of whom the narrator admires. The narrator’s grandmother is a baker, her mother a doctor, her Auntie an artist, her sister a fashionable high school student, and her cousin just earned a black belt. Each woman represented is different and wears her hijab differently. Far from hindering individuality, the hijab is an extension of one’s uniqueness in this beautifully told story. The author and illustrator are both Muslim women. In an afterward, the author, Hena Khan, notes that she chooses not to wear a hijab, whereas the illustrator, AAliya Jaleel, is pictured on the book jacket wearing a hijab. This reiterates wearing a hijab as a choice women make based on their interpretation of Islam. Under My Hijab is a wonderful book that will reflect the life experiences of many Muslim children, while introducing children who are not Muslim to the religious and cultural meanings of wearing a hijab. I think this one should be in every school library, and I highly recommend it for personal collections.